From stylish cottages and cabins to historic inns and romantic B&Bs, Oklahoma offers many beautiful places to stay. Whether you are looking for outdoor activities such as lake fishing, canoeing and hiking, or want to stay near city museums and restaurants, our list includes a range of options, including spa resorts, fun tipi accommodations, and romantic inns with fireplaces and unique décor. Popular Oklahoma destinations include Tulsa, Norman and Oklahoma City. 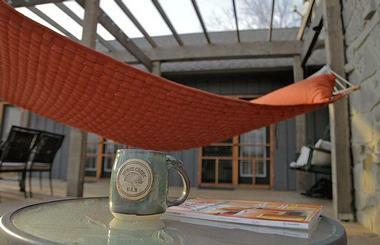 River’s Edge Cottages are located on 300 acres in southeastern Oklahoma. The twelve cottages are spacious and furnished with full kitchens and fireplaces. 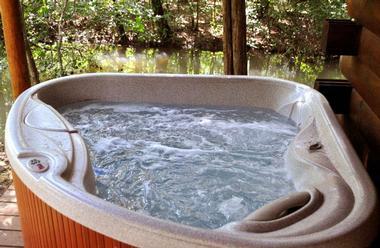 Try your hand at fishing, biking, canoeing, or hiking, or take it easy by relaxing in the hot tub or bird watching. All of these activities can be done at or near the cottages. 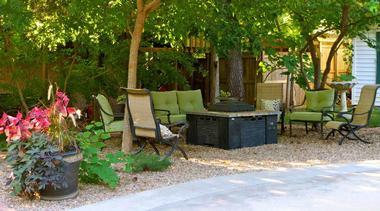 Come nighttime, guests can light a fire in the fire pit and tell stories or roast marshmallows. Due to the secluded nature of the cottages, it is recommended that guests bring enough food to last them throughout their stay so that they can prepare their meals in the cabins. If you prefer, however, you can also find places to eat in Smithville, which is a short drive from the cottages. Cottages start at $150 per night. 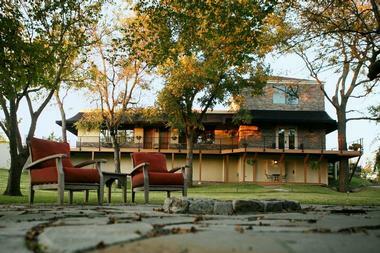 True to its name, Two Hearts Inn in Edmond is a romantic place for couples to relax and unwind. The inn has six suites in total, three of which are luxurious Honeymoon Suites ideal for newlyweds who want their wedding night to be romantic and unforgettable. Each suite includes a sitting area, dining room, private deck, and amazing views of the scenery. When you feel like relaxing a little, you can lounge around inside the room and watch television on your large flat screen TV. The other suites have decorations and furnishings inspired by different destinations around the world; one of the most popular is Suite Tuscany. Every morning, enjoy delicious breakfast options, or stop by for lunch or dinner to try different soups, salads and entrees. Rooms start at $159 per night. Keep reading for more unique Oklahoma destinations. The Montford Inn Bed and Breakfast in Norman is a relaxing getaway with sixteen individually furnished guest rooms. Amenities include private bathrooms, cable TV, fireplaces, and Wi-Fi. The romantic cottages are a great idea for couples and include private screened-in porches, walk-in showers, and whirlpool baths. Echo Canyon Spa Resort is a luxurious romantic getaway offering elegantly decorated suites and cottages that have their own unique themes. Each room has fine linens, a private bath, satellite TV, a DVD player, and some even have fireplaces, allowing you to really set the mood. The Aloha Spa, located at the resort, offers over one hundred relaxing treatments, from massages and body wraps to manicures and facials. There are several activities guests can enjoy, including hiking, biking, fishing, golfing, sailing, swimming, and other water sports. If you would prefer to simply take in the scenery or appreciate the wildlife, there are plenty of sightseeing opportunities in the beautiful parks. If you are looking for great Oklahoma resorts for food lovers, you’ll be pleased by the dining options as well. The Baron of Beef restaurant at the resort serves fantastic four-course culinary meals. The menu includes entrees such as Kobe beef tenderloin, grilled duck breast, jumbo shrimp scampi, and chicken picatta. The restaurant also caters to vegans and vegetarians, and has several options for their dietary preferences. Rooms start at $205 per night. Shiloh Morning Inn provides guests with a quaint holiday with all the niceties of a bed and breakfast. There are five luxurious suites available, each of which has a gas fireplace, a private balcony or patio, a TV with a DVD player, a stocked mini fridge, a jetted tub, and Wi-Fi access. The inn also has four tucked away cottages that have a living and dining area and a kitchen. Some of them also feature extras such as wet bars, separate tub and showers, and hot tubs. On site, guests can try out catch and release fishing, bird watching, or exploring the walking trails. A selection of books, DVDs, board games, and cards are also available. A three-course breakfast is served each morning in the Main House dining room. There are also two dining options available for those who want to eat in their rooms - choose from a light dinner or a dinner with two entrees. Rooms start at $159 per night. Meadowlake Ranch Bed and Breakfast is located along Route 66. Visitors can stay in one of four cabins. Each cabin has a kitchenette, a private bath, a living area with a TV, a fireplace, and a patio. While there, guests can take tomahawk throwing lessons or try out rifle and pistol shooting, trophy bass fishing, horseback riding, and archery. The Ranch also offers hayrides and straw calf roping. Visitors are welcome to take advantage of bird watching, walking trails, and the wildlife observation towers located around the property. The Ranch serves a hearty home cooked country style breakfast every morning, and picnic lunches are also available depending on the type of reservation you make. Cedar Rock Inn Bed and Breakfast in Tulsa is located on 65 picturesque acres, giving visitors a beautiful place to wind down and relax. The Inn has five uniquely decorated suites, each featuring its own theme. All rooms are equipped with a flat screen TV and DVD player, a private bath, a ceiling fan, a telephone, and Wi-Fi access. Several rooms have the additional luxuries of whirlpool tubs or fireplaces. You can treat yourself with a trip to the spa, which offers services such as Swedish and hot stone massages. Adults can also make purchases from the well-stocked Wine Reserve, located on the property. A delicious breakfast is served each morning in the dining room of the main building. Picnic lunches can also be purchased; these include a blanket, the necessary tableware, and a choice between three meal options. Suites start at $149 per night. The Victorian Lady Bed and Breakfast takes its guests back to the Victorian era while still providing them with modern luxuries. Three elegantly decorated suites feature their own theme and are furnished with beautiful, antique period furniture. Each room comes with central air conditioning and heating, a high definition LCD TV with DVD player, a ceiling fan, and a private bath. Guests can read, relax, or mingle with one another in the parlor room or sitting room or they can spend time admiring the beautiful perennial garden located on the property. A gourmet three-course breakfast is served every morning in the dining room, and guests can find plenty of places to enjoy lunch or dinner at in the nearby town, which also has shopping and other sources of entertainment. Rooms start at $99 per night. Colcord Hotel, a member of Historic Hotels of America, in Oklahoma City offers a selection of elegantly furnished guest rooms and two excellent dining options with city views. Choose to stay in a deluxe king, deluxe double, or superior corner king room, each of which has their own appeals and includes upscale amenities. You can request a wake-up call and start your morning off with freshly brewed tea or coffee. The hotel provides bottled water along with local and international newspapers, as well as Wi-Fi access. Colcord Hotel is known for its fine dining; Flint is located inside the hotel and serves gourmet cuisine in a casual setting. The restaurant has a lounge where you can sample tasty dishes made with fresh local ingredients. Vast Restaurant is another elegant dining option with a varied and tempting menu. Rooms start at $159 per night. Reuben’s Rest Bed and Breakfast offers a comfortable retreat near the Beavers Bend State Park where guests can relax. There are three guest rooms, each with a comfortable pillow-top king sized mattress and a private bath. The rooms have television, DVD and CD players, plush bathrobes, coffee and tea, a library of movies and access to Wi-Fi. There are plenty of on-site outdoor activities, including hiking, fishing, golfing, canoeing, horseback riding, and even go-carting. 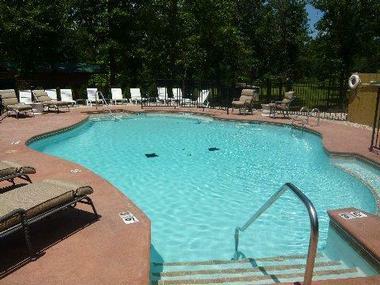 Guests can rent a boat or go swimming and partake in other water sports at nearby Broken Bow Lake. A full three-course breakfast is served each morning in the dining room. Guests also have access to the guest pantry, which includes a refrigerator, microwave, coffeepot, beverages and snacks. Wildlife museums, shopping, and other eateries are all available in or near the town of Broken Bow. Rooms start at $139 per night. Keep reading for more unique Oklahoma destinations. Southard House in Enid is bed and breakfast with four tastefully decorated rooms that showcase soothing and romantic themes. All of the rooms have a dining table, luxury linens, private baths, and high definition TV with cable and Netflix. There are several large, open rooms for visitors to enjoy, whether they choose to read, socialize with the other guests, or just relax in one of the sitting areas. You can choose from a large collection of books and spend some time reading or play a few tunes on the piano located in one of the common rooms. A continental breakfast is offered every weekday and is served in the hospitality suite. On weekends, a gourmet breakfast is available in the dining room, or you can request it to be delivered to your room. Rooms start at $119 per night. Lago Vista Bed and Breakfast is an excellent choice for a peaceful mountainside getaway if you are looking for something other than a standard hotel or cabin. The four guestrooms all overlook the lake and feature a balcony, which offers a better view of the surroundings. The rooms have a king-sized bed fitted with soft sheets, a fireplace, satellite television, a private bath, a Jacuzzi tub, and a towel warmer. Guests can treat themselves to Swedish, hot stone, or couples massages during their stay, or relax in the swimming pool or hot tub outside on the deck. A theatre room shows movies nightly, and guests can participate in big games or sip beer and wine each evening. Enjoy a full breakfast every morning, and take advantage of the unlimited snacks and beverages available throughout the day. For lunch and dinner, guests can travel a short distance to the nearby town and enjoy a variety of restaurants and shopping. Rooms start at $400 for two nights. 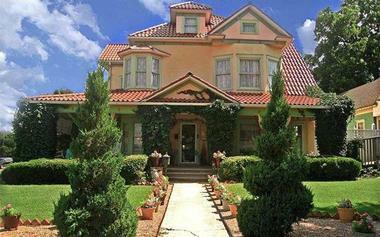 Historic Hayes House Bed and Breakfast is an incredibly appealing option for couples in search of an intimate vacation. Romantic candles and elegant furnishings help set the mood in the two suites available to visitors. The rooms have goose down pillows and feather mattresses, ensuring ultimate comfort. If guests want to relax a little, they can take advantage of cable television or use the VCR or DVD player. The rooms also feature a kitchenette and either a fireplace or a balcony. Couples can enjoy the outdoor pool or any of the sitting areas located throughout the property. In-room massages are also available, along with a romance package that includes a delivery of one dozen roses and chocolate-covered strawberries. A gourmet breakfast is served in the morning, and guests can choose from items such as French toast, blueberry muffins, pancakes, fresh juice, or Starbucks coffee. The inn is also located near several restaurants, including the Harmony House and Miss Addie’s, if guests are in the mood for other meal options. Rooms start at $115 per night. Arcadia Inn offers a romantic setting where couples can enjoy their honeymoon or a romantic weekend getaway. There are eight individually decorated rooms, each with their own unique charms. The rooms all have private baths and a television, and most of them have a DVD library, coffee makers, gas fireplaces, and comfortable sitting areas. In your spare time, you can relax or get to know the other guests in the common rooms. For breakfast, the inn serves a delicious in-room breakfast of waffles or pancakes covered in vanilla-butter sauce each morning. For other meals, guests can check out some of the nearby restaurants including Boulevard Steak House, Hideaway Pizza, or Café 501. The Inn provides a variety of brochures and guides to help guests discover interesting trips and activities, including visits to nearby day spas, the Oklahoma City zoo, and nearby shopping. Rooms start at $169 per night. The Whispering Pines Inn is a charming bed and breakfast with a touch of the 1900s. The seven rooms have been carefully arranged and decorated, ensuring no two experiences are alike. The rooms are equipped with cable television with and a DVD player, a mini refrigerator, a microwave, and a coffee maker. Guests can meander through the property and admire the beautiful landscape or take a few minutes to try out the swing near the koi pond. The restaurant at the Inn has a full service bar with a variety of liquor, beer, and wines in stock. The restaurant also offers a brunch and dinner menu as well as a room service option. The gourmet options served for dinner range from shrimp cocktail to pork tenderloin. Nearby, horseback riding, an IMAX theater, two casinos, and a park offer a choice of entertainment options. Rooms start at $79 per night. Situated just next to a lake and the mountains, Quartz Mountain Resort is a unique destination with 118 rooms designed and decorated with a cabin-like feel. 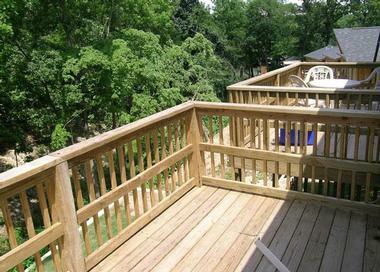 The rooms have either private balconies or patios, satellite TV, high speed Internet, and coffee makers. Guests who enjoy being in the water will appreciate the swimming pool, whirlpool, and seasonal water at this resort. Cave exploration, hiking, biking trails, go-carts, fishing, and paddleboats are also available for more adventurous types. A large, classic dining room houses the restaurant as well as two large fireplaces. The absolutely gorgeous views make for an unforgettable dining experience. The Sundance Café serves breakfast, lunch, and dinner daily, and offers salads, pizza, burgers, filling entrees, and decadent desserts including turtle cheesecake, layered chocolate cake, and Haagen-Dazs ice cream. Rooms start at $109 per night. A to Z Guest Ranch is located in the Kiamichi Mountains and offers a vacation experience that is perfect for those who love the outdoors. There are four cabins, all with a fully equipped kitchen, a sitting area, and a deck or patio with either a grill or hot tub. Guests can spend their time participating in exciting activities like horseback riding the trail rides or trying out ATV riding. If you prefer something a little more soothing, an on-staff massage therapist will attend to adults while the children play outside in the yard. Guests can spend a peaceful evening sitting on the porch and taking in the beautiful scenery, or they might choose to walk around the property and enjoy the serene ambience of the woods. The ranch Chef prepares fabulous meals that are available in the Wagon Wheel Room and can also be ordered to go. Guests can also bring their own food to prepare in their cabins to ensure that it is to their taste. Cabins start at $75 per night. 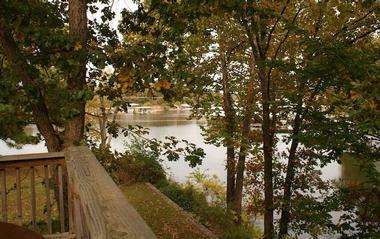 Candlewyck Cove Resort is set right next to the water and features a private boat dock. The rooms vary, and you have options such as deluxe hotel-style rooms, king suites, and lake front cabins. Each luxury rental comes with a mini fridge, microwave, and other amenities. If you choose to rent a townhouse or home, you will have the use of a full kitchen which is ideal for families. Wi-Fi is also available for guest use. The resort has a park with a basketball court, areas for tetherball and volleyball, a play gym, and several great places for a picnic. You can also rent pontoon, Jet Ski, or ski boats with H20 Sports Rental. Southern Oaks Resort is an affordable getaway in Vinita, offering Cub Cabins for two, Honeymoon Cabin, and the Resort Family Cabin or the Deluxe Family Cabin, each of which accommodates six. Just minutes away from Grand Lake, Southern Oak Resort includes a basketball court, fire pits, and picnic areas onsite. You can spend time playing with your family in the brand new arcade room that comes complete with a pool table, or unwind in the saltwater pool. During the summer, kick back on the patio or play a fun game of horseshoes out back while you watch for wildlife in the distance. Cabins start at $59. Lindley House Garden Cottages Bed and Breakfast allows guests to have a romantic excursion in a convenient location. There are three cottages and four rooms available, all individually decorated. Guest rooms have a private bath, cable TV, a DVD player, and access to Wi-Fi. The cottages offer the same amenities available in the rooms with the addition of jetted tubs, stocked refrigerators, stoves, and a gourmet breakfast delivered to the cottage. The house offers public spaces for guests to relax and mingle in, including a beautiful garden that is perfect for reading in or strolling through. Breakfast is served each morning in the main house. Guests can find plenty of places to eat and things to do in the downtown shopping area of Duncan, as well as a country club nearby. Rooms start at $79 per night. Pine Lodge Resort is sheltered beneath the grandiose timbers near Grand Lake. In fact, many of the cabins are right along the shoreline. When visiting this peaceful location, you will lose yourself in the pure beauty of nature, where the scenery is sure to take your breath away. Each cabin comes with either a queen or king bed, rock fireplace, private hot tub, and a deck that overlooks the lake or woods. If you are celebrating a special occasion, you will love the grill and full kitchen included in every cabin, which allows you to prepare your own intimate dinner. Each cabin also has firewood, towels, and linens. Nearby attractions include multiple parks and nature centers, along with Grand Belle River Boat Cruises and Har-Ber Village Antique Museum. Rates start at $128 per night. Stone Creek Bed and Breakfast is set on over 80 acres of land and provides a wonderful escape for couples or groups of friends looking for a secluded getaway. The cabin has a full kitchen, a fireplace, cots and air mattresses, a whirlpool tub, satellite TV, and wireless Internet access. The cabin has a unique sleeping porch, which features a queen-sized bed that hangs from the arbor and has a beautiful view of the lake. 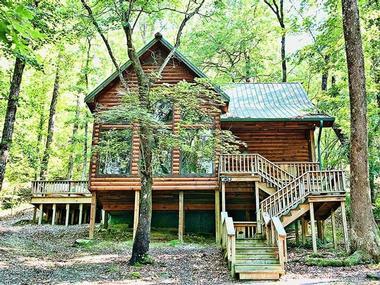 Guests can relax in the warmth of the cabin, explore the many acres, or spend time at the lake. Full service meals are offered at the cabin, as well as picnic basket lunches and dessert every evening. There is also an outdoor movie package available for guests who want to watch a movie under the stars while enjoying popcorn, candy and refreshing beverages. Cabin rates start at $200 per night. 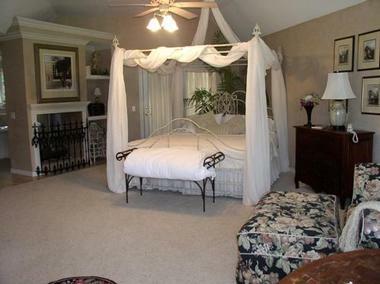 The Manor Bed and Breakfast is perfect for couples looking for a quiet hideaway. The manor has only one suite and therefore, couples benefit from all the one-on-one services the Manor provides without having to share attention with others. The room features a private bath with a 2-person jetted tub under a skylight, a living room, a mini bar with a coffee maker, a balcony, a 32 inch flat screen TV, and a pull out couch. The manor offers free Wi-Fi, complimentary snacks, private access to the suite, and a cozy fire pit. The bed and breakfast is conveniently located within walking distance of several museums and parks. The manor can also deliver a delicious gourmet breakfast to guests in their suite, in the dining room, or out on the patio. Breakfast will be prepared to the guests’ taste, and they can choose from options such as thick-cut bacon and homemade donuts to crepes or pancakes. The suite starts at $150 per night. Oklahoma City, the ideal destination for a weekend getaway, boasts 250 days of sunshine per year and a huge variety of attractions and activities for all ages. The Oklahoma History Center and the Oklahoma Hall of Fame at the Gaylord-Pickens Museum will interest history buffs, while the American Banjo Museum and the Cowboy and Western Heritage Museum are fun for everyone. You can immerse yourself in the vibrant arts scene at the Civic Center Music Hall, a historic art deco building which is home to the Oklahoma Ballet, Oklahoma Symphony Orchestra and the Oklahoma Philharmonic, or cross the road to the Oklahoma City Museum of Art which showcases everything from ancient Egyptian art to the work of French Impressionists. Exhibit C and IAO (Individual Artists of Oklahoma) feature local artists. The vibrant Paseo Arts District hosts the First Friday Art Walk each month, featuring almost 20 galleries. In the Boathouse District you can rent canoes, kayaks, paddle boards and more and at Riversport Adventures and Riversport Rapids you can try a thrilling SkyZip across the river or go white-water rafting. You can hike through the Stinchcomb Wildlife Refuge or at Lake Hefner, or stroll through Martin Park Nature Center and the Myriad Botanical Gardens, which have a special children's garden and a splash park. Tulsa offers visitors a good mix of art and culture, outdoor activities and a few interesting museums to keep you busy on rainy days. Art enthusiasts are in for a treat in Tulsa, and you can feast your eyes on the excellent collections at the Philbrook Museum of Art, the Gilcrease Museum (which features a brilliant collection of western American art), 108 Contemporary, and the many galleries of the Brady Arts District. Music lovers can take a trip down memory lane at the Oklahoma Jazz Hall of Fame and the Woody Guthrie Center, or watch the Tulsa Ballet in action at the Tulsa Performing Arts Center. The Tulsa Air and Space Museum & Planetarium, the Tulsa Zoo (which features a Children's Zoo with petting area) and the Tulsa Aquarium are all great for families. If you enjoy getting outside and active you can head to the Tulsa River Parks where 26 miles of trails are waiting to be explored - you can hike or rent a bike from Tom's Rivertrail Bicycles. There is more hiking at the Turkey Mountain Urban Wilderness Area or you can visit Woodward Park to stroll through beautiful gardens which feature over 9000 roses. Natural Falls State Park is located in the beautiful Ozark Highlands of north-east Oklahoma and offers weekenders a perfect escape from the city and the chance to get back to nature in pristine surroundings. Visitors can get close to the 77-foot waterfall which cascades through a rocky ledge to form a beautiful natural pool at the base of the valley. (Note: no swimming is allowed in the park). You can visit the park on a day trip, but spending a few nights camping under the stars is the best way to fully appreciate the beautiful natural surroundings and lush forests. There are both RV sites with full hookups and tent sites available, where you can set up camp. Hiking and bird-watching are the two main activities in the park and there are four and a half miles of nature trails you can follow, which will give you the chance to enjoy the railed observation platform at the top of the falls, as well at the lower observation platform at the foot of the falls. You can picnic throughout the park and there are several picnic tables and grills. In addition to biking, hiking and camping, you can try your hand at catch-and-release fly fishing on the river or play volleyball, horseshoes, basketball or disc golf, and there is a playground for younger children. 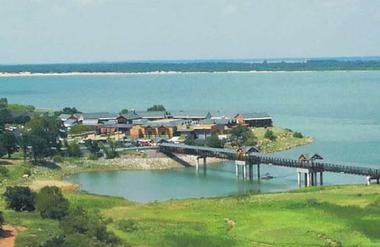 Lake Murray State Park is Oklahoma's largest and oldest state park, as well as one of the most family-friendly vacation destinations in the state, offering an endless variety of activities for all ages. The lake-side situation of the park means that you can choose from huge variety of water sports including paddle-boats, canoeing, kayaking, sailing, jet-skis and ski boats, as well as fishing - all equipment is available for rental on site or you can bring your own. There are also sandy swimming beaches and fishing or swimming pontoons which you can rent. If you prefer to keep your feet dry you can enjoy biking, hiking and bird watching - there are several good trails to follow - or try some more extreme action at the ATV area specially dedicated to three and four-wheelers, off-road bikers and motorcycles. In addition there is a 72 par 18-hole golf course, a riding stable, tennis courts, baseball diamond, and badminton and volleyball nets. Younger children can enjoy miniature golf, hayrides, rollerblading and various ranger-led programs. You can park your RV at one of over 300 sites with hookups which can be found in several different areas of the park or simply set up a tent in one of the campsites and indulge your adventurous side. If you prefer a little more comfort you can rent a cabin or stay at the park lodge. Escape the city and head for the hills of the picturesque San Bois Mountains in south-east Oklahoma where the Robber's Cave State Park is waiting to entertain the whole family with diverse outdoor activities. The hilly terrain of the park offers great hiking opportunities along miles of trails and if you have a good head for heights you can do some rock climbing and learn rappelling. There is an adjacent wildlife management area for wildlife viewing and a forested hunting area. Hiking up to Robber's Cave, notorious as a former hideout for outlaws Jesse James and Belle Star, is a very popular activity and there is good bird watching along the way and several places to picnic. You can jump aboard the Belle Starr Express, a miniature trains that takes you on a 30 minute scenic circuit of the park or head straight for Lake Carlton to enjoy paddleboats, canoes, rafting and kayaking, (rentals available on site or bring your own) or simply swimming off the sandy beach or in the pool. Other activities available inside the park include horse riding (rentals available), great fishing and a 250-acre ATV riding area. There are several ranger-led nature activities and a playground and miniature golf for younger children. You can bring your RV or tent and rent a serviced site, stay in the lodge or rent a fully-equipped cabin. Muskogee is full of surprises for visitors, offering a good blend of historic, arty and outdoor activities to keep the whole family entertained. You can learn about local history at the 3 Rivers Museum, which is dedicated to the history of the American West. Here you can go on one of several tours offered by the Muskogee Regional Heritage Center, including a Historic Homes and Building Tour and a Haunted History Trolley Tour. The Five Civilized Tribes Museum provides a solemn reminder of how thousands of African Americans were forcibly removed from their homes, while at the Muskogee War Memorial Park you can step aboard the U.S.S. Batfish, an authentic WWII submarine. Other interesting historic attractions you can visit include the Fort Gibson National Cemetery, the Fort Gibson Stockade and the Castle of Muskogee, which regularly features fun festivals for all ages. Muskogee is surrounded by five lakes which offer great water sports, fishing and hiking for outdoor enthusiasts. The beautifully restored Roxy Theater, the Muskogee Civic Center and the Muskogee Little Theatre feature live entertainment, and if you visit during May - June you can listen to the Symphony in the Park concerts at Honor Heights Park. Families can visit the Georgia-Pacific Butterfly Park at Honor Heights Park or have hours of summer fun at the River Country Family Water Park. Turner Falls Park is tucked into the scenic hills of the Arbuckle Mountains in Davis Oklahoma, offering an easily accessible weekend getaway with plenty of outdoor activities for all ages. The most popular activity in the park is enjoying the crystal-clear waters of the natural pool at the foot of the 77-foot waterfall. In addition to swimming in this beautiful natural environment, the park also has several wadding areas and sandy beaches for younger children and some fun water slides. When you need a change from swimming you can go hiking along several trails including a moderately challenging 3.5 mile loop that starts at the falls and takes you to explore three caves in the hills above the waterfall. The rivers are stocked with trout and you can enjoy some of the best fishing in Oklahoma. Other interesting attractions include the Rock Castle, also known as Colling's Castle, which dates back to the Great Depression and has many (now crumbling) rooms to explore and some excellent views over the park. There are several picnic areas dotted around the park and you can bring your RV, pitch a tent in the camping site or rent a cabin. (Teepee style tents are available to hire on site.) You can buy basic provisions at the convenience store and enjoy a meal at the concessions. The enviable lake-side situation of the Tenkiller State Park, which rambles along 130 miles of Lake Tenkiller shoreline, ensures that visitors have a host of wonderful water sports to enjoy, along with a variety of other shore-based activities. If you enjoy camping you can look forward to a great back-to-nature adventure at one of several camping areas with serviced RV sites and tent sites. If you prefer a little more comfort, there are cabins and cottages to rent. Scuba enthusiasts consider Lake Tenkiller to be one of the best diving destinations in the state, and apart from excellent water clarity all the way down to 28ft, the lake hides a variety of amazing dive sites including several wreck dives. If you have never tried scuba diving, Tenkiller State Park is the place to learn and there is a certified dive school on site which offers lessons and equipment hire. Other water sports you can enjoy in the park include canoeing, kayaking, boating, tubing and water skiing, as well as swimming and fishing. The park also has an outdoor swimming pool with a diving board, water slide and recliners. If you prefer to keep your feet dry you can enjoy hiking or biking along two multi-purpose paved trails and a nature trail, neither of which is too challenging and will give you a chance to do some bird watching. Situated just 20 miles south of Oklahoma City, Norman is a delightful getaway destination which offers an almost endless variety of cultural, fun and educational activities. Start by visiting the Norman Welcome Center in Main Street to pick up maps and get inside tips on current attractions from enthusiastic locals. If you enjoy historic architecture you can visit the Boyd House, the Alpha Chi Omega Sorority House and the Beta Theta Pi Fraternity House, to see three distinctly difference styles of historic buildings, and then move on to the Chautauque and Miller Historic Districts where over 150 historic homes dating back to the 1920's can be found. Art lovers can tour the Fred Jones Jr. Museum of Art to see works by Van Gogh, Monet and Renoir, enjoy a show at the historic Sooner Theatre or watch the Norman Philharmonic, the Norman Symphony Orchestra or the Norman Ballet in action. Lake Thunderbird State Park is the place to head to for hiking, biking, camping and every kind of water sports you can think off along 86 miles of shoreline. Families have many attractions to choose from including Andy Alligator's Fun Park and Andy Alligator's Water Park, the Discovery Cove Nature Center, the fascinating National Weather Center and the Sam Noble Oklahoma Museum of Natural History. Enid is situated about 100 miles north of Oklahoma City and is a great place to escape to for an interesting and entertaining weekend. Enid has a colorful historic background which you can uncover by visiting the Cherokee Strip Regional Heritage Center and the Leona Mitchell Southern Heights Heritage Center and Museum. The Waverley and Kenwood Historic Districts cover over 30 city blocks and a walking tour through the two districts will fascinate anyone interested in the architecture of the early 1900's. For outdoor recreation you can hike, cycle, jog or skate the Enid Recreation Trails, visit the Enid Skate Park or play a round at one of the several golf courses in the area. There are plenty of fun activities for children including the Hoover Park Splash Pads, the Champion Park Splash Pads, Splash Zone Water Park, miniature golf, carousel and train rides at Meadowlake Park and hours of fun at Leonardo's Children's Museum/Adventure Quest. To soak up some authentic Enid culture you can visit the Enid Symphony Center, watch a play at the Gaslight Theatre or listen to a concert at the Briggs Auditorium. There is good shopping at several malls and foodies can enjoy a wine tasting at Indian Creek Village Winery or learn all about fruit wines and their culinary uses at the Plain View Winery.